The Black Knight Sonic squash racquet is the latest in the line of high value racquets from Black Knight. It is direct replacement for the Black Knight Bandit 2, which replaced the Black Knight Bandit. 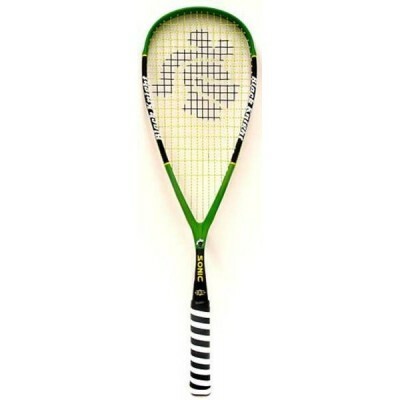 This is a great racquet for any playing level from beginner through to advanced. In particular for beginner's it is a very good weight at 140g. The longer main strings give very good power to this racquet. Like almost all Black Knight racquets it comes strung from the factory with a very good set of strings, in this case the Ashaway SuperNick XL Micro. If you are new to the game and looking for a really good racquet to start learning with this is a great choice. If you are user of the Bandit or Bandit 2 and need a new racquet look no further as this is there direct replacement.